• Number: 1-10, 11-20, 21-30, 31-40, 41-50, 51-60, 61-70, 71-80, 81-90, 91-100. 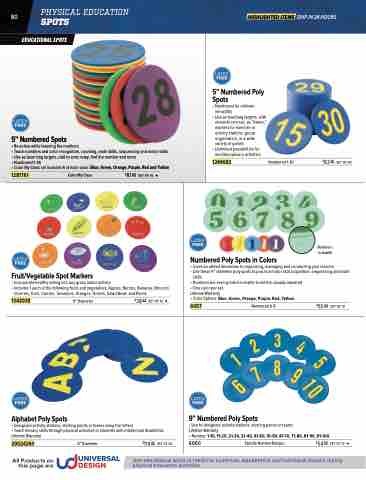 Use educational spots to reinforce numerical, alphabetical and nutritional lessons during physical education activities. • Numbers are even printed in braille to aid the visually impaired • One color per set. • Color Options: Blue, Green, Orange, Purple, Red, Yellow.